The New England States--Maine, New Hampshire, Vermont, Massachusetts, Connecticut and Rhode Island-- lie within USDA hardiness zones 3 to 7. Pick a large flowering tree for a specimen plant or pick a small flowering tree for a container on a patio. Either one or both will be a welcome addition to any garden. Autumn cherry (Prunus subhirtella 'Autumnalis') is a member of the rose family. The tree grows from 20 to 35 feet tall and about the same in width. The tree produces more than one trunk. Kobus magnolia (Magnolia kobus) is native to Japan and grows up to 25 feet tall and 35 feet wide with a dense, round crown. Purpleleaf sand cherry (Prunus x cistena) is a member of the rose family that grows from 7 to 14 feet tall and 5 feet wide. Autumn cherry produces dark-green, deciduous, oblong leaves from 1-1/2 to 4 inches long that turn yellow or bronze in the fall. The dark-green, egg-shaped, deciduous leaves of the kobus magnolia measure 3 to 6 inches long and turn yellow in the fall. Purpleleaf sand cherry features red-purple, deciduous leaves that measure 2 inches long and retain their color through the fall. 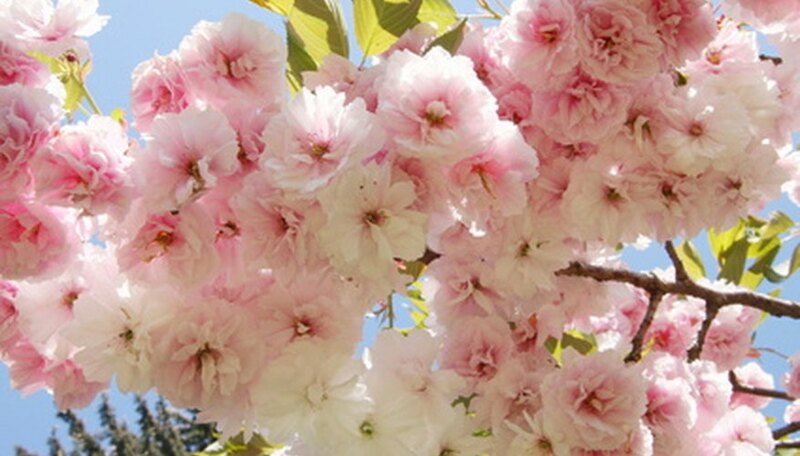 The flowers of the autumn cherry are double and pink in color and bloom in March or early April before the leaves put in the their appearance. The flowers produce small, black oval fruit that is a favorite food for birds. Kobus magnolia only produces flowers on older trees. Pink-tinged white flowers bloom in the spring, measure 4 inches across and give way to red seeds that the birds will love. Purpleleaf sand cherry features fragrant, pink-purple flowers that boom in May after the leaves and give way to small, black-purple fruit. Autumn cherry is hardy in USDA zones 5 to 8. Plant the tree in full sun and a moist, well-drained soil. Kobus magnolia is hardy in zones 5 to 8. Plant in full sun or partial shade and a soil that is moist, rich and well-drained. Purpleleaf sand cherry needs full sun and a well drained soil. The tree is hardy in zones 2 to 8. Autumn cherry and purpleleaf sand cherry are short lived and susceptible to infestation from insects and damage from diseases. Kobus magnolia has a thin bark that is easily damaged and is damaged by scale insects.